The next time you throw a dinner party, you should consider healthy appetizers to kick off your gathering. Appetizers are a great way to whet one’s appetite for what’s to come, and when appetizers are kept healthy you don’t have to worry about your dinner guests getting full before the main meal. 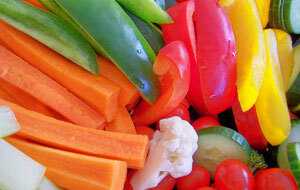 When menu planning think fresh produce and low fat ingredients. Apple Slices with Goat Cheese: In a small bowl, mix together ¼ cup crumbled goat cheese and 1 tablespoon honey. Spread ½ teaspoon of the goat cheese-honey mixture onto 24 thin slices of 1 large red apple that has been cored. Top each apple slice with a watercress leaf. Arrange apple slices on a serving platter and sprinkle with black pepper. Cheese, Bacon and Cranberry Endive Boats: In a bowl, mix together ½ cup crumbled blue cheese and 6 tablespoons low-fat sour cream. Spread 1 ½ teaspoons of the blue cheese-sour cream mixture into 12 endive leaves. Top with crumbled bacon and dried cranberries. Melon, Mozzarella and Prosciutto Skewers: Thread 1 melon cube, 1 thin slice prosciutto and 1 small mozzarella cheese ball onto each of 20 (4-inch) wodden skewers. Sprinkle with cracked black pepper.